It's finally here - Election Day 2008. Does anyone feel like I do and think this was the all time l-o-n-g-e-s-t Presidential campaign of all time? But this is the day - our time to make a choice. Republican or Democrat. . . Liberal or Conservative. . .Red State or Blue. . .it doesn't matter which you prefer. The important thing is to get yourself over to the polling place and VOTE! Let's make this year one for the record books - not because of color or gender. 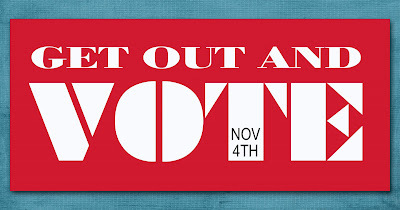 Let's make this the year of the largest voter turnout in history! I can't wait to go vote today! and the main thing I wanted to say is: Your new blog banner is SO GREAT! Completely and totally gorgeous!